Samaritans365 Club at Sandpiper Shores Elem. School collected hundreds of items for us! We are a volunteer-driven non-profit organization, and we love getting help from people of all ages and all abilities! From schools, Girl Scouts, Boy Scouts and companies helping with collections, to stay-at-home parents and retirees helping with data entry or event planning, your time and energy is always welcome! 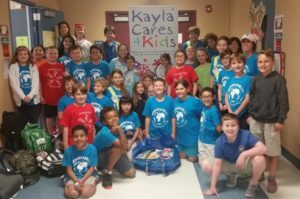 If you’re interested in volunteering for a dynamic and fun organization, Kayla Cares 4 Kids looks forward to hearing from you!